If you thought only the spirits got better with age……then you haven’t met the suave and classy Abbas Shabbir Lehry…..! Always impeccable whether in pinstripes for business or in running gear, he easily gives the younger lot a run for their money. His focus, energy and enthusiasm, to give the best effort whether in training or in race is infectious. 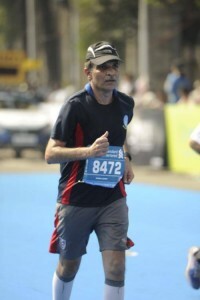 Business commitments and a hectic travel schedule not withstanding, he manages to keep up with training and long runs. He’s run quite many marathon events and his best timings are 1:59 for a half and 5:02 for a full marathon. He also cross trains with weekly stints of cycling, and more recently trekking and hill running. Dream Runners is proud to have him as a member of the trust where he is a quiet guiding force with his background and experience.